Whether supported by a trellis or rambling over a fence, climbing roses provide a beautiful and eye-catching display in any garden. In the past their glorious blooms appeared only in early summer, with a few varieties blooming again in the fall. 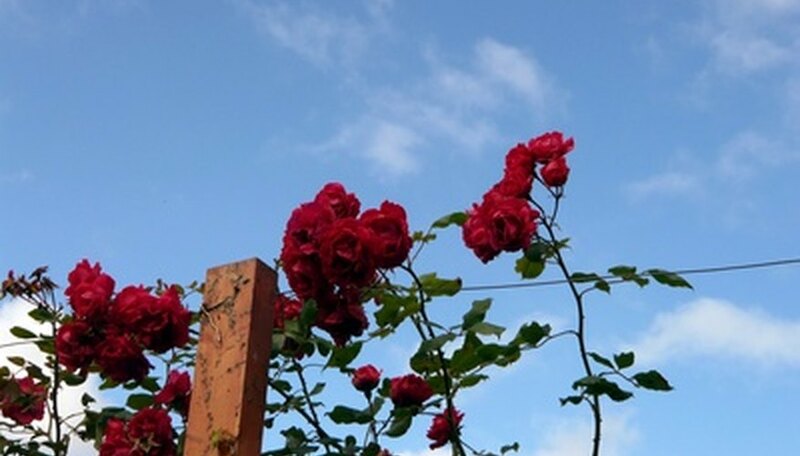 Today, however, there are a number of ever-blooming climbing roses that will produce flowers all summer, giving the garden a continuous point of interest through the various growing seasons. The 'William Baffin' rose is an ever-blooming climber with a reputation as an easy-to-grow, disease-resistant rose. This climbing rose is very hardy; it has repeatedly proven resistant to the most common rose diseases, black spot and powdery mildew and can easily be grown as far north as Zone 2. 'William Baffin' has deep-pink double blossoms that bloom in abundance off and on throughout the summer and can grow as tall as 10 feet if properly trained and supported. 'New Dawn' is a sport, or a mutation, of the 'Dr. W. Van Fleet' rose which has been bred as a separate cultivar. These roses are a soft, light pink as buds and fade to a delicate cream or ivory as the rose blossoms. While the first spring bloom usually produces the most flowers, the rose will bloom throughout the summer. Hardy to Zone 4, 'New Dawn' can grow to a height of 10 feet and in 1997 was voted the most popular rose in the world by 11th World Convention of Rose Societies. “Darlow’s Enigma” is an old "found" rose whose origin is still under examination (hence the double-quotes around its name). This vigorous white climbing rose has tiny, semi-double blossoms with a cluster of golden stamen. This rose blooms all summer long and possesses a lingering, sweet fragrance. It is winter hardy to Zone 4, is one of the few roses that is shade-tolerant and is extremely resistant to most rose diseases. An excellent climber, “Darlow’s Enigma” will grow up to 10 feet tall. The ‘Portlandia’ rose produces large, multi-petal blossoms that shade from apricot at the center to deep pink and cream outer petals. A reliable repeat bloomer, this showy rose has a sweet fragrance of medium strength and a dark green foliage. Hardy to Zone 5, the ‘Portlandia’ is extremely disease resistant and can be grown either as a shrub or as a climbing rose.